So this happened on the airplane of a recent work trip. It gets better. 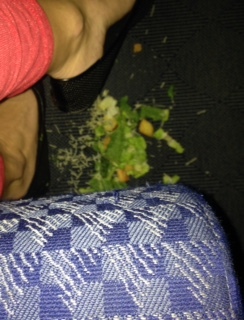 The fight attendant was squatted down right beside my feet getting drinks when I had my salad-lid malfunction. I was embarrassed and very apologetic. She said, “Oh, don’t worry about it. The cabin crew will take care of it.” I thanked her, after apologizing sixty-three more times, and tried to pretend that my feet weren’t surrounded by romaine for the next five hours of my flight. I like to use my flight times to read, work on projects, or write blog posts. It was as I was sitting here writing a different post that I remembered a time back when I was in kindergarten (yes, I have a great memory, I know). There was this boy in my class who constantly had “accidents”. I’m not sure why he wet his pants so often, but what I remember is the horrible teacher embarrassing him, and making him clean up the urine on the floor each time. Thinking of this story compared with my own, the differences are glaring – and should be the opposite. I’m an adult who should be able to handle my food requirements. He was a five-year-old, in school for the first time, possibly even with medical issues. I was quickly reassured, he was quickly belittled. My embarrassment lasted less than a minute because of the flight attendant’s attitude. I have no idea what kind of lasting impact that teacher’s behavior had on the little boy in my class. A lady two rows up from me turned around to look back towards the bathroom. I watched her face as she noticed my Caesar salad lying on the floor, and had to laugh. Thankfully, she didn’t see me watching her (I don’t need “creepy airplane lady” added to my list). She had this instant look of disdain. I’m still laughing in memory and thinking that each person who walks past me is probably sharing her thoughts. But, as someone who has had two children and all the messes and embarrassing moments that come with that would do, I just laugh and remind myself that most of the time I get through meals without dumping half of it on the floor. These people just will never experience that normalcy. But back to the kindergarten memory…would that boy have been able to laugh if he saw his peers looking disdainfully at the puddle under his chair? Certainly not. And the teacher only made matters one hundred times worse by lacking compassion and grace. We hold so much power. Be a positive influence in the life of others. Pick up their book when they drop it. Talk kindly to the cashier even if he’s less-than-friendly. Smile at the lady who spills her salad at the floor and share a laugh. Speak truth into the hearts of the children in your life. And the truth is that they are amazing human beings who deserve to be encouraged, supported, and cared for by adults around them. This entry was posted in Education, personal. Bookmark the permalink.